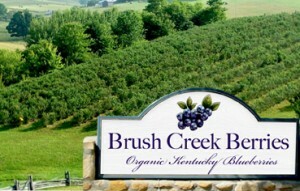 Established in 2004, the Brush Creek Berries farm is a family owned and operated blueberry farm located in the outskirts of Burkesville, Kentucky. The fruit farm takes great care in producing Kentucky Proud certified organic blueberries, with a strict attention to quality control in order to maintain both flavor and nutritional benefits of our hand-picked berries. Our 10 acre, well-manicured farm, is known for Kentucky’s best fruits largely due to our organic process and simply respecting the soil. We do not use any harmful pesticides, herbicides, fungicides or chemical-based fertilizers, which is what separates us from most other farms, and with that, we stand alone in our practices and set the bar for future farmers.